San Agustin Church Manila, still surviving and flourishing. San Agustin Church Manila, take a step back in time. Interestingly enough when I visited the San Agustin Church Manila, I could not gain direct access, they had a wedding on. Everyone was dressed up in there best and the women looked like they were all trying to out do each other and they were all succeeding, absolutely delightful. I felt a bit lost wondering up in a pair of shorts and shirt, but I kept well away. Most weekends you will find a wedding in progress at the San Agustin Church and what a beautiful place to get married, in the oldest surviving church in the Philippines. The design is a legacy of Spanish architecture in the Baroque style. The San Agustin Church was declared a UNESCO World Heritage site in 1994. Where is the San Agustin Church? The San Agustin Church is in Manila and more specifically inside Intramuros or the walled city. You will find it on General Luna Drive. Opening hours of San Agustin Church is daily at 8:00am to 12:00 and then closes and reopens at 1:00pm through to 6:00pm. Right beside and physically adjoining is the San Agustin Museum. Entry to both is free, however you are expected to make a donation when you enter the Museum. The church has an eventful past. 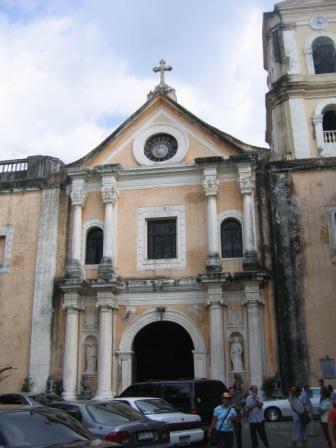 It is known as the Church of St Paul and was originally built in 1571 as the first church of the Agustinian Order. Now the first disaster occurred in 1574 when Chinese pirates destroyed it. Then in the next twelve years it had a problem with fire and was burnt to the ground twice, in 1583 and again in 1586. It was then decided to rebuild the San Agustin Church in stone. The rebuilding started in 1587 and took to 1604 to be completed. However just because it was built of stone didn't mean it was not going to have an easy life. It survived the earthquakes of 1645, 1754, 1863 and 1880, not a bad effort. The San Agustin Church Manila was ransacked by the British in 1762 and was damaged during the battle of Manila at the end of World War II in 1945. In a way it has faired better than others in Intramuros in particular Manila Cathedral. The interior of San Agustin Church Manila has magnificent trompe l'oeil murals covering the walls and the ceiling, you really have to see them to understand the work that must have gone into them to create such an incredible piece of art. If you go upstairs through the Museum, you can gain access to the choir loft, from here you can get a birds eye view of the churches interior, which is where the above photo was taken. You can see the 14th Century Chandeliers hanging throughout the interior of the San Agustin Church. The entire church looks and feels as if it belongs in a different era and actually entering it makes you feel like you are stepping back in time, almost intruding. In the choir loft have a look at the seats or benches. Not too remarkable, but all 60 were hand carved from Molave which is a tropical hardwood in the 17th century. In todays age of mass production and a throw away society it is nice to see something survive and flourish from yesteryear. The remains of Miguel Lopez de Legazpi, Juan de Salcedo, Lavezares and Goiti all Spanish Conquistadors are buried here in the San Agustin Church. 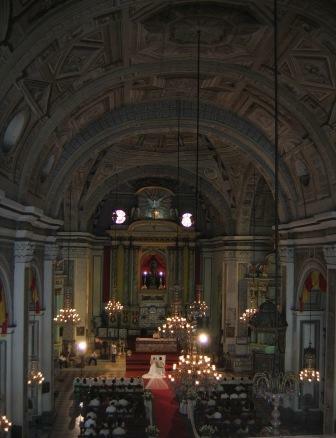 The San Agustin Church is well worth a visit, include it in your tour of Intramuros. It is a must see, also have a look at the San Agustin Museum, which attaches to the side. If you want to look at some more photos of the San Agustin Church have a look here.